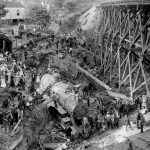 Railroad Legends – The Wreck of Old 97 – SMARTT: Scale Models, Arts, & Technologies, inc. They handed Joseph A (Steve) Broady his orders in Monroe, Virginia. Train number 97 or the Fast Mail was Southern Railways’ crack mail and express train between Washington, DC and Atlanta, GA. 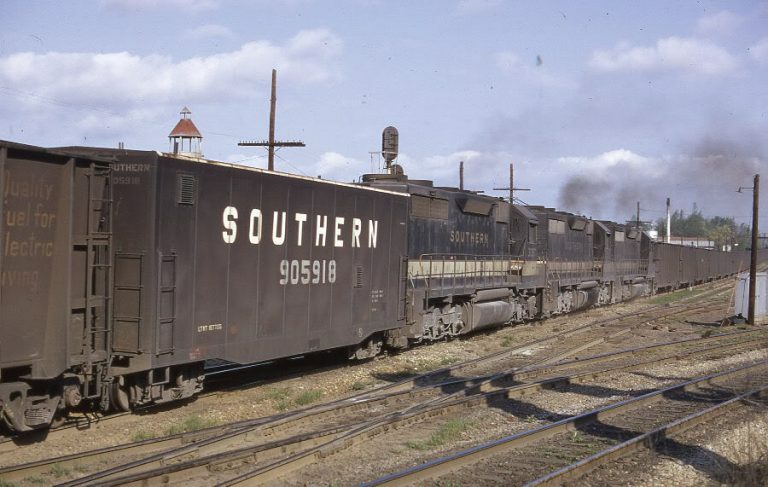 Traveling over the Southern’s famed Piedmont Division, the train would change crews at two locations, Monroe, VA and Spencer, NC before reaching Atlanta. From there the train would continue on to New Orleans. The Southern’s Piedmont Division was a “hill and dale” railroad, with only a few mountain grades, including the White Mountain grade near Danville, VA. Because the line was built quickly and on the cheap, there were few cuts or fills to flatten out the roller coaster right-of-way. To this day the Piedmont Division still has that reputation; in fact back in the middle 1960’s it was the testing ground for Southern’s use of master-slave locomotives. The railroad would put up to three radio controlled locomotives midway in the train to help compensate for the roller coaster terrain, with the lead locomotive controlling. With this background information on the Piedmont Division, it is not hard to understand that it was a dangerous railroad, especially the run between Monroe, VA , and Spencer, NC. This was the most difficult and dangerous part of the division. 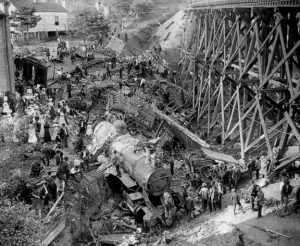 In fact, earlier that year there was a wreck in Lexington, NC with the same train, killing both the engineer and fireman. Engineer Steve Broady had his work cut out for him. He was behind schedule, one hour late, when 97 arrived in Monroe. Making up one hour on a line that is only 166 miles long would be difficult under any conditions, let alone on the Piedmont Division. In order to make up the time, Steve would need to average 51 MPH instead of the normal 39 MPH allotted in the timetable. No easy feat, especially when you consider the fact that Steve Broady was a freight train engineer and not experienced in operating the Baldwin 4-6-0 passenger locomotive to which he was assigned. There is also a very interesting parallel with the wreck involving Casey Jones three years earlier. Casey was pressed into operating a passenger train outside of his normal run, on a train that was 95 minutes behind schedule. In Casey’s case, it was not lack of qualification that caused the problem but lack of adequate rest. Steve Broady had made up ½ hour by the time he reached the grade at White Oak Mountain. As he started his descent into the city of Danville, VA, his speed reached more than 70MPH. This was much too fast for this section of the railroad. 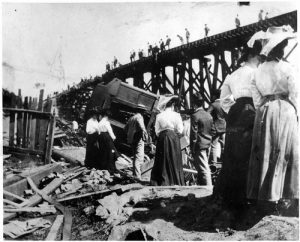 When the train hit the tight curve just before the trestle she could no longer hold the rails. It was that curve just before the Stillhouse Trestle that did him in. The train jumped the track and landed in Cherrystone Creek below the trestle, killing him and 10 others. Also, like the wreck with Casey Jones three years earlier, Steve’s whistle went into a long scream as the train rounded the curve. Back in April of 1987, we were out shooting the return of N&W 2-6-6-4 locomotive 1218. The last part of the ferry move from Birmingham AL, was Spencer to Roanoke, VA. As the train rounded a curve near where Steve Broady had lost his air brakes 84 years earlier (the mainline had been relocated since the wreck) the 1218’s whistle burst into a scream, a tribute to Steve Broady and train 97. Like Casey Jones and John Henry, Steve Broady and old 97 have been immortalized in song, arguably one of the most well know Country and Western songs in history. And, like the others, the Wreck of Old 97 has been performed by musicians from rock to folk to country. Never speak hard words to your true-lovin’ husband. All of you Civil War buffs might remember another song about a train and Danville, VA: “The Night They Drove Old Dixie Down.” The railroad between Danville and Richmond was the last supply line open to that besieged city during the winter of 1865. Soon the tracks would be torn up by Union cavalry and General Lee would retreat to the west. The song was written by Robbie Robertson, a Canadian musician and first recorded by The Band. However, the most popular rendition of the song was done by Joan Baez; her version reached as high as number 3 in 1971. As for the railroad, it was rebuilt after the war and would later become part of the Southern Railroad, which would be its only access to Richmond, VA. I have some very good shots on my play list if you want to check them out. The layout is very irsvepsime and the whole building has 4 big layouts . several HO, one N Scale and one O scale, not to mention a 3 rail layout in a separate room. Johnny Cash’s version of the song leaves out the important stuff. Broady lost his airbrake. When that happens in a train, all the brakes come on, full force. Broady’s train went into a skid, leaving him with nothing to do but whistle “abandon ship” and back his drivers. At least that gave him somthing do do while waiting around to die.